"At Inmoclinc we are very satisfied with the commercial relationship we have had with Guy-Raymond for a number of years. We really appreciate the quality of your castors and the lead time"
INMOCLINC are an experienced manufacturer of high quality products for the medical industry with a worldwide presence, and knew as a longstanding customer that Guy-Raymond would have a solution to help them realise their latest design ambitions. As you will see from the photographs displayed, INMOCLINIC combines sleek, practical design with beautiful use of colour to provide their customers with aesthetically pleasing products retaining practicality and functionality. Previously, we had supplied INMOCLINC with our GRX125 (White, RAL 9003) for a range of trolleys. For their new range, as well as requiring some conductive castors, INMOCLINC also wanted a range of interchangeable coloured wheel discs to complement their colourful designs. Once we had received samples from INMOCLINC of the four colours required, we were able to liaise with our supplier of coloured masterbatch to offer an exact colour match. However, there was another small issue to be resolved. 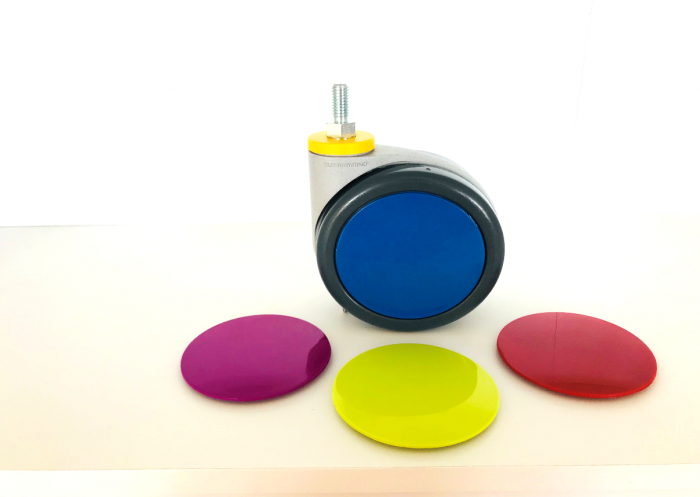 Our conductive castors normally have a yellow dot on the wheel disc to differentiate them from non-conductive castors, this raised a potential problem with the interchangeable coloured discs as not all of the castors were required to be conductive. Following talks with their designated Sales Manager and our in house research and development team, we swiftly reached a solution by proposing that the castor’s top cap be moulded in yellow, so regardless of potential wheel disc changes, the conductive castors could still be easily recognised therefore maintaining safety in certain hospital environments. At Guy-Raymond, we pride ourselves on the attention we give to each order and each specification, attention to detail equals quality. As well as the satisfaction we get from fulfilling a specification, it was also wonderful to see our products featured on such beautiful designs.